2/20/2012 : In an interesting (and sad) twist, it is being reported that the Happiness is Pets "recommended" vet may not even be licensed in Illinois and had previously relinquished their license in Indiana. See: Examiner for the report. 2/19/2012 : The number of confirmed Distemper cases has increased however even more importantly, a group of owners who purchased from Happiness is Pets and ended up with sick, including distemper, dogs has filed a lawsuit seeking class action status. Here is one, of many, announcements of the lawsuit. If you have purchased a puppy from Happiness is Pets and are interested in more information on the class action lawsuit, please contact the law firm handing this case, The Clinton Law Firm at 312-357-1515 or email attorney Stephanie Capps at sacappslaw@yahoo.com. 1/29/2012 : The number of confirmed Distemper cases is now 4 with 3 more suspected with the dogs coming from 3 different locations. See: Examiner for more information. 1/29/2012 : The Southtown Star had a report from a protest held on Sunday outside the Orland Park store. : Southtown Star. Unfortunately the reporter left too early to witness the "Stand up Guy" mentioned in the story get himself arrested when he, right in front of the police, was confrontational/harassing to the demonstrators. We have found a few people who would like to demonstrate in front of pet stores in their towns. We turned our signs and brochures over to one of them and they held their first demonstration this past weekend in Lombard. We were able to attend and support them, as many of you did for us, and we think it went quite well for their first demonstration. We look forward to their next one and joining them again. The dogs have won! On July 1st the store packed the dogs into a UHaul (is this a proper transport method? ), as reported by employees of other local businesses in the same strip mall, and then pulled the cages and sign the following day and closed the store! Less then 2 years from open to close. See the report here. 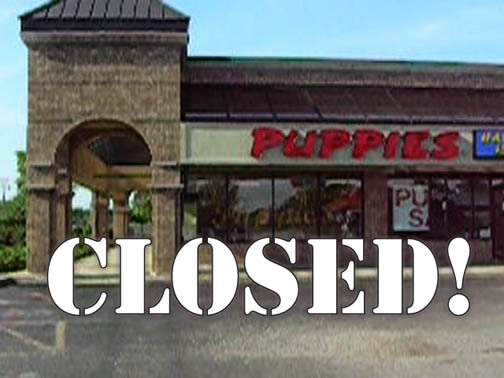 The parents stuck in the puppymills have one less store to churn out puppies for so we consider this a small victory for them! We truely believe this was a result of many factors of which the Oprah shows and the public information demonstrations may have at least played a contributing factor. Since this store opened in the town we live in we have had a vested interest. While we would like to see similar outcomes in other towns we believe someone living in a city with a puppy selling pet store interested in a similar outcome should take the lead in their city. This gives you a stronger position when working with your local government and media. We would be happy to share our story with you, give some suggestions based on our experience and even pass along our signs to you to get started in your area.... plus we wouldn't mind attending demonstrations that you organize too. During this past cold winter, please remember that we had a choice to stay inside where it is warm. The dogs in the puppy mills do not have this choice. The first video on this page shows the outdoor environment that many mills keep the dogs in. UPDATE! The suit has been dropped. You can read more about it here. Welcome to the Puppy Lawsuit website. This site was created, on the advice of our attorneys, to help spread the word about puppy mills, pet stores and the on going saga of the local pet store that filed a lawsuit against us because we were willing to uncover the truth and then speak up about what we discovered. As this situation continues we will provide updates here and you are more than welcome to contact us with any information you have or comments you would like to make. To provide a brief summary, a local chain of pet stores known as Happiness is Pets in the Chicago area decided to open a new store in our town. Many residents of the town voiced their concerns about this "product" that this chain sells. We wrote to the local papers. We have held legal and peaceful demonstrations. Both activities protected under the first amendment of the Constitution of the United States of America. Or so we thought. The owner decided that our investigations, our connecting the dots and our informing the public was not something he wanted revealed, so his attorney sent us and another citizen a cease and desist threat letter. The next day we received a second letter. The following day the store's owner filed a lawsuit against us claiming defamation. Now, I'm no legal expert... that's what our team of attorneys is for, but according to this web site defamation has a couple of defenses. First, the truth. If the statements are truthful then there is no defamantion. By all of our research, first hand consumer reports, statistics and reports from animal shelters and rescue groups, internet research (see The Links) and discussions with those in the veterinary business, our statements have been truthful. Secondly, another defense is opinion. A demonstration and a "Voice your opinion" piece in the local paper definitely qualify as opinion. Finally we have passed all of our materials past our attorneys and they are quite satisifed that we have done nothing wrong. So why are we being sued? As far as we can tell, it's an attempt to bully or harass us into hiding. To stop us from providing consumers with the information they need to make an educated decision. A few people have questioned the concern over a pet store selling pets. However it isn't entirely the pet itself but rather the source of that pet and the background of that pet. Consider a different example. A clothing store that sells shirts made by child labor in a sweat shop. I think that almost everyone would be concerned at this "product" and its source and would want the public to be aware of what they are really buying/buying into. Why should the standard be any different for a different business? If the source of the product is questionable (a puppy mill) should not the average consumer be entitled to know this? And if a business is not going to provide information like this, then it is up to concerned citizens to make others aware of this. For this we are being sued. We have even offered a suggestion of a slightly different business model that has proven to be successful. 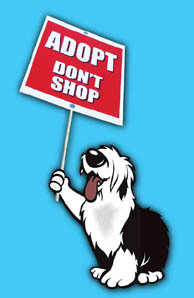 Sell the supplies and work with local adoption agencies and shelters to adopt dogs and cats. PetSmart, a national chain, has this as their apparent business model and is doing quite well based on the number of new stores they are opening. Other local pet supply only stores in our area have also been very successful. Some are very niche market stores with a very focused line of products and they are still in business. It's disappointing that this suggestion isn't even being considered. We welcome any information and even your own stories about this issue that you would like to share. Please use the Contact Us button to send your story. Also let us know if you specifically would, (or would not) like it to be published on this web site.